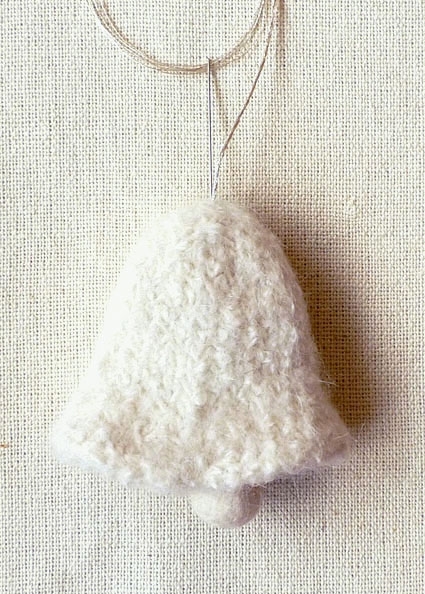 Bells are one of my very favorite holiday motifs. I love the tinkle-plinkle of their happy sound and the gentle curve of their friendly shape. And I love that, whatever your culture or faith, bells harken people together with a suggestion of peace and goodwill. 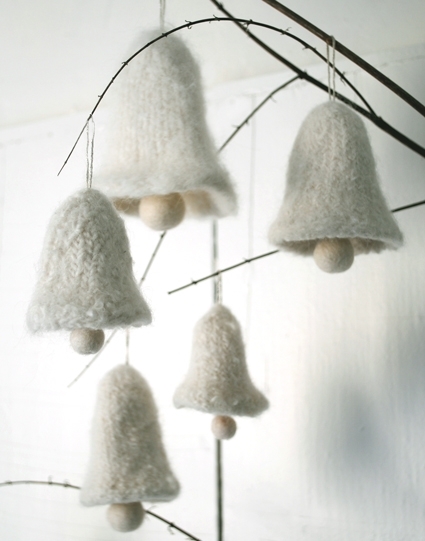 These Felted Bell Ornaments are such a simple way to celebrate the season, lending a handmade warmth and a soft touch. Hang some on your Christmas tree or on a pretty winter branch, string a bunch together in a beautiful garland, or give a few in a specially wrapped package to friends and family. Wherever their destination, these bells will strike just the right note! Blue Sky’s Sportweight Alpaca, 100% Baby Alpaca. This color is Natural White. Blue Sky’s Suri Merino, 60% Baby Suri, 40% Merino. This color is Snow. Blue Sky’s Brushed Suri, 67% Baby Suri, 22% Merino, 11% Bamboo. This color is Whipped Cream. Blue Sky’s Techno, 68% Baby Alpaca, 10% Extra Fine Merino, 22% Silk. This color is Fame. 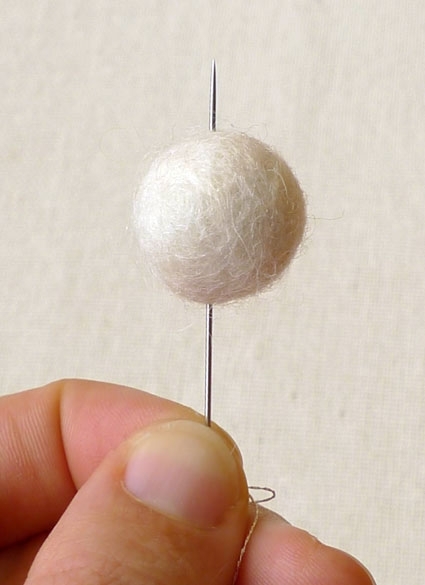 Handbehg Felt Balls. 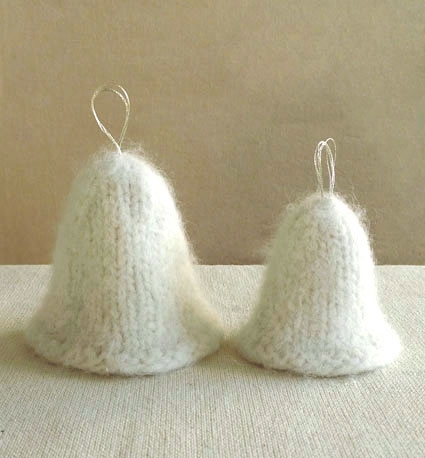 The size depends on your yarn and which bell size you knit. I used the 1 cm, 1.5 and 2 cm sizes (see below for specifics). DMC Metallic Embroidery Floss. This color is Silver. 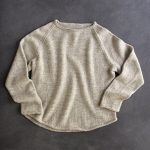 The precise gauge for this pattern isn’t crucial, but it is important that you use a needle two sizes larger than you normally would (or than the recommended size) in order to achieve a very loose knit. Cast 32 stitches onto double pointed needles. Cut the yarn and sew it through the remaining stitches. Pull tight and bring the tail to the inside of the bell. Cast 24 stitches onto double pointed needles. 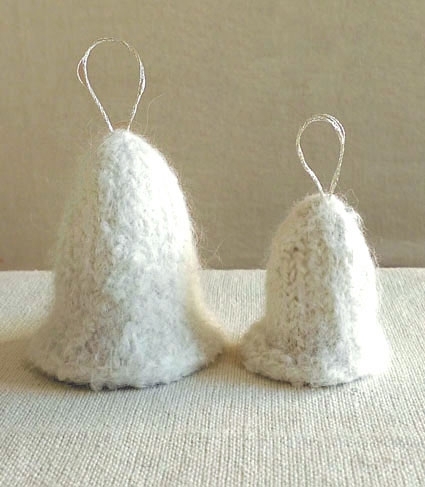 Put your bells inside a pillowcase and then into a washing machine (for this project, I’d say either a top-loading or front-loading machine is fine!). Throw in a pair of jeans (or some tennis balls) and some delicate wash detergent. Set the temperature to hot, the water level to high, and start the wash cycle. You want maximum agitation, so for the quickest results and if you can, keep the machine in the wash cycle. If you’re using a top-loading machine, check your project frequently (for front-loaders, you’ll probably have to wait to the end of the cycle). When your bells are how you like them, take them out and squeeze out the excess water. 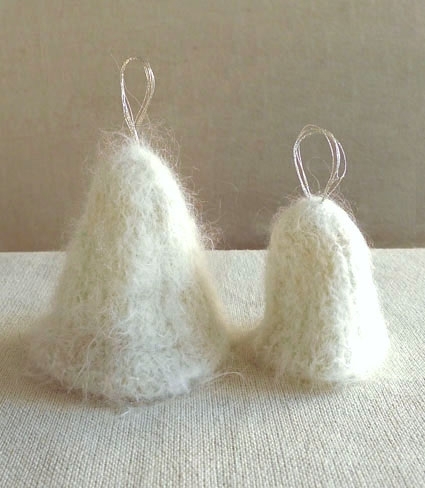 Shape them in to pretty bell shapes and allow them to air dry (and dry and dry…). 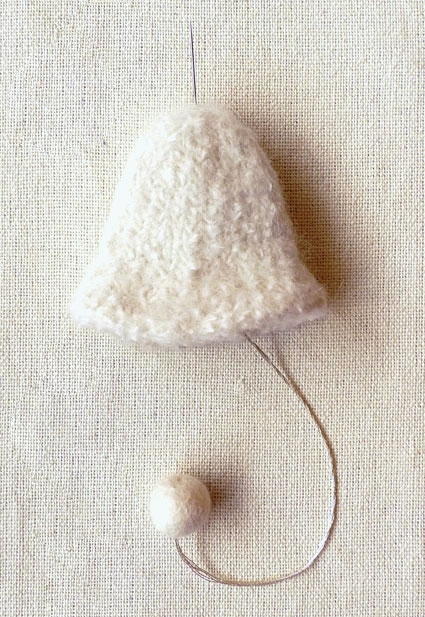 Cut a piece of embroidery thread about 20 inches long and thread it onto an embroidery needle. 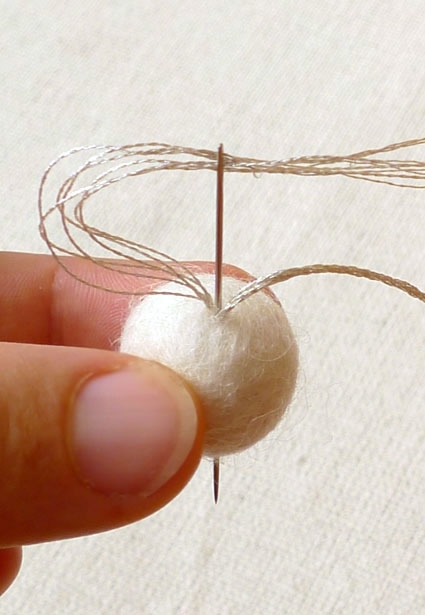 Push the needle through the center of the felt ball. 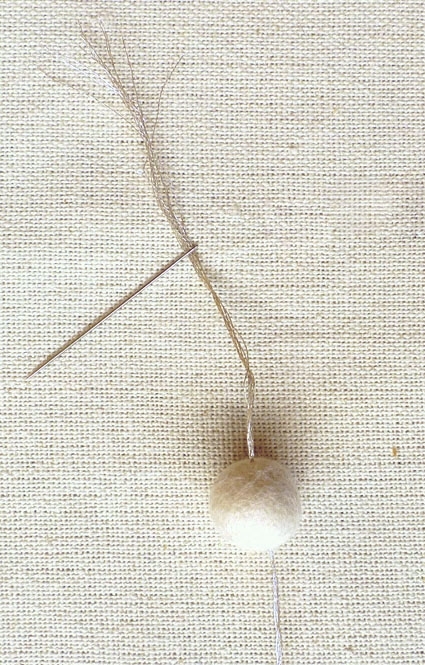 Pull about 5 or 6 inches of thread through the ball. Put the needle back into the ball, right next to where it came out, and push it back through the center of the ball, coming out next to the original going-in point. Push the needle back through the original starting point and push it out of the ball anyplace. 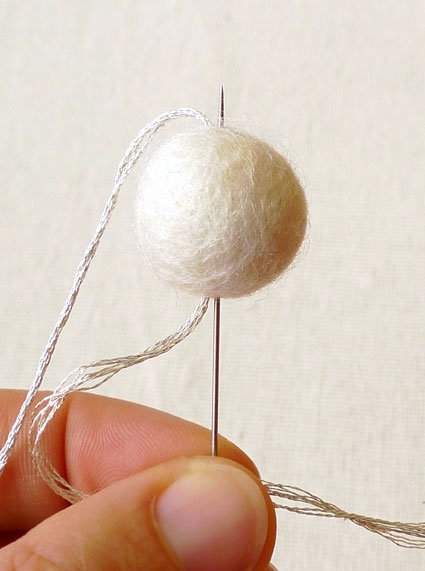 Trim the thread very close to the ball, and if necessary, use the blunt end of your needle to push the end of the thread into the ball so you can’t see it. Now, thread the other end of the embroidery floss onto the needle. Bring the needle up through the inside of the bell, and push it out though the top middle. Pull the thread through until the ball is where you want it (I like it about 1/2 way out the bottom of the bell). Push the needle back through the top of the bell, next to where you came out. Pull the needle until the loop is the size you want. Clip the tail, turn the bell right side out and you’re all done! everything y'all do is just too cute. I want to do it all ! Very cute bells. I love the bells! But I am having a problem in the decreases. Onthe small bell after I make my first set of decreases I am left with 18 stitches then for the 2nd set of decreases, I am left with 15 stitches not 12 and then am left with an odd amount of stitches. Is there a step missing? Please help. Thanks. I love these! 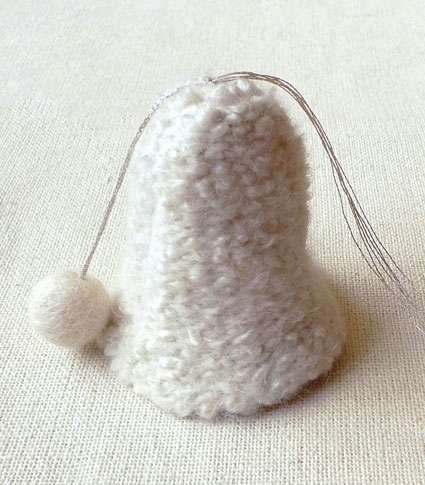 My mother collects bells…this will be such a nice addition. How many bells does one skein of yarn make? Egads! I'm so sorry! You're absolutely right, and I have fixed the pattern. Thank you so much for letting us know and I'm sorry for the confusion! 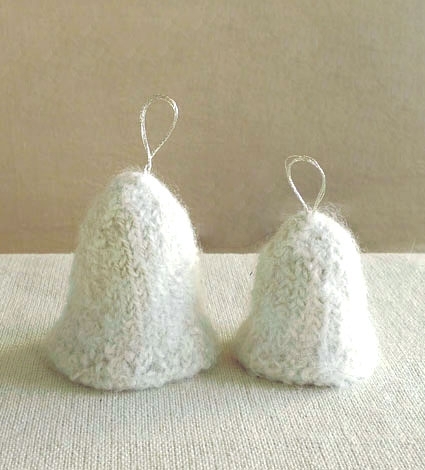 It depends on which size bell you make and also on what yarn you use, but unless you have a very short skein, you should be able to get at least two large bells out of one skein, and probably more like 4 or 5. Thankyou, ThankYou for correcting this. I just could not figure out what i had done. Looking forward to making these!!!! 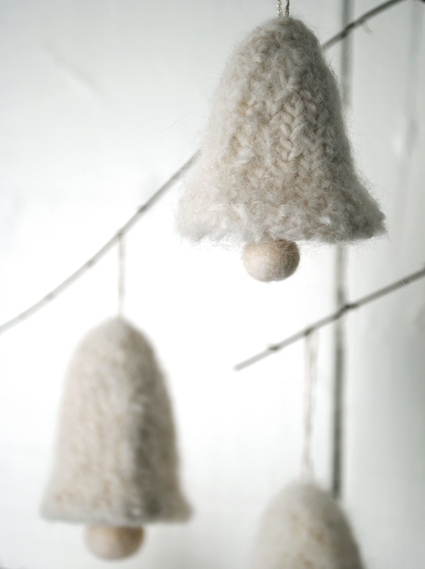 These bells are gorgeous! I have now made a couple of batches for pre-christmas presents and have very much enjoyed my first foray into felting. I sewed some small iridescent sequins onto one batch and some teeny seed beads on the second. They just catch the light and look lovely. Thank you for a wonderful pattern! I may be blind, but where does it tell you how to make the felt balls? 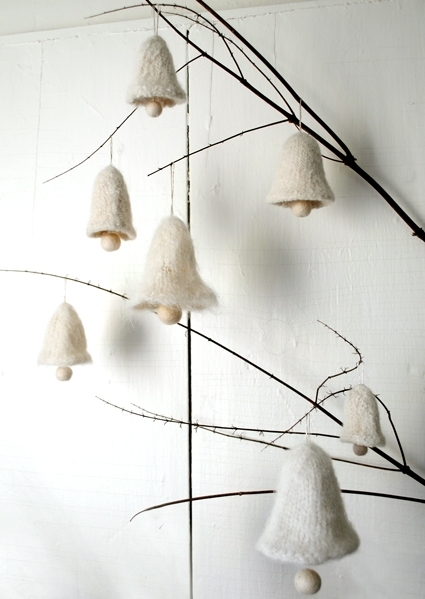 I love this idea and want to make them for Christmas. Thank you for your quick reply, much appreciated. But then you give needle sizes to use. So, should I be using the needle sizes recommended or two sizes large than the recommended needles? Great question! 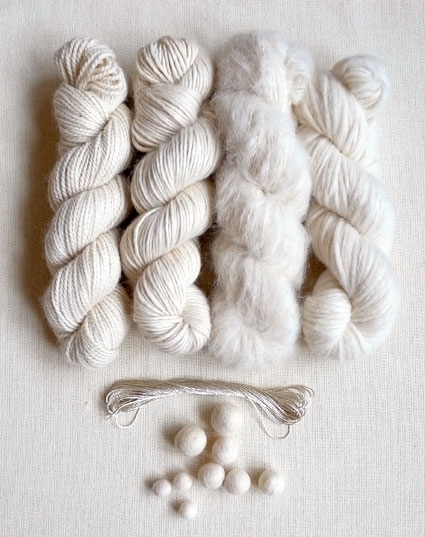 This note only applies if you are substituting a different yarn that is thicker or thinner than the yarns we selected. 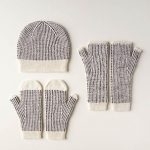 If you are using the same yarns we used in the pattern, you can go ahead and use the needle sizes listed in the pattern, but if you are using a different yarn, you will need to check the yarn label to see what needle size is recommended for the yarn, and then use a needle two sizes larger. Do you sell all the materials you will need as a set? Thanks for reaching out! Unfortunately, we do not offer a kit for this project, but we do have links to purchase all of the materials you will need in the pattern!